PunchLight WLi - Wireless continues ! The Recording Strip USB is a simple, compact light unit designed to fit in tight spots, and, with its strong magnetic base, to securely attach to any steel surface. The new hardware allows customisation of all signals: Recording (usually red) and Record Ready (usually yellow), Visual Metronome, and Cue can each be a separate colour. We have received many requests for our products to be connected wirelessly. So we developed a simple solution to replace cables from our triggers (PunchLight Midi, GPI, DLi or Relay Switch Box USB) that go to external lights. 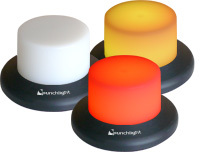 The PunchLight Wireless Upgrade Kit consists of two small boxes. The first is a transmitter, connected to one of the trigger units via a 12V out. The second unit is a receiver, a small box which has one output and a connector for an external PSU. You can connect any of the PunchLight external lights to the receiver. The "Studio Warning Lamp" is a unique, aesthetically stunning studio warning light. A compact and solid unit made of anodized aluminium, it signals "Recording" by glowing red, and "Record Ready" by glowing yellow. Recording Lamp USB - now with visual metronome ! The RECORDING Lamp USB is a small plexiglass light unit which indicates Recording start/stop and record "ready". The new hardware allows customisation of all lamp signals: Recording (usually red) and Record Ready (usually yellow), Visual Metronome, and Cue can each be a separate colour. The plexiglass design and matt finish provide an interesting light effect. The unit is powered directly from USB. No PSU or Midi Interface is needed ! The Recording Strip is a simple, compact light unit designed to fit in tight spots, and, with its strong magnetic base, to securely attach to any steel surface. It has to be connected to the PunchLight DLi, PunchLight GPI, PunchLight MIDI or the Relay SwitchBox either of which act as a trigger. Similar to the PunchLight GPI and PunchLight MIDI, the PunchLight DLi automatically switches on an external light unit such as the Recording Display, Recording PlexSign, Recording Ring or Recording Lamp. It has front panel LED status indication - recording or record ready.